The Sun are reporting that Watford have ended their interest in Ben Wilmot just days after claiming the player had picked Watford over Arsenal and Tottenham. Wilmot was withdrawn from the Stevenage squad at the weekend as a move draws closer but it’s still not clear who has won the race for his signature. He has also been withdrawn from the squad for Wednesday evening’s game against Mansfield. On Monday, reported in an EXCLUSIVE that Watford had agreed a deal in excess of £1.5m. They report a Watford source as saying, “The club have moved on in its list of targets and priorities. This quote clearly makes The Sun’s EXCLUSIVE a load of nonsense. Not only did Watford not ‘win the race’, they didn’t even return with another bid. 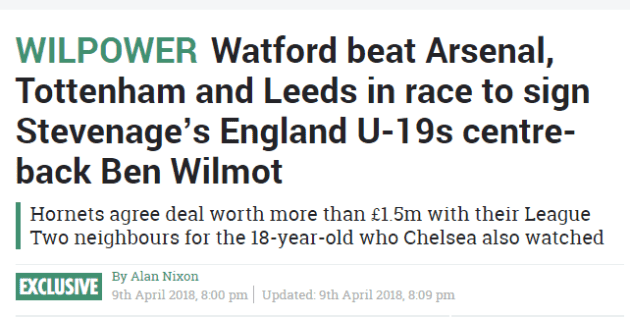 Wilmot is a 6ft2 centreback and the only player outside the top two divisions to get a call-up to the England u19 squad for their recent Euro qualifiers. Stevenage play in League Two. Until 12 months ago he was playing as a midfielder. He came through the ranks at Stevenage but has only been in the first team for the past six months. “I’m really excited but it still hasn’t really sunk in,” Wilmot told The Independent in his first major newspaper interview after his England call-up. The Football League paper reported at the weekend that the 18-year-old seems ‘certain’ to move this summer while the S*n claimed both Arsenal and Tottenham have made official approaches for the player in the past only to be rebuffed. That valuation was said to be between £1m (The Independent) and £2m (The S*n before their EXCLUSIVE). The Hornets originally had a bid of £500,000 turned down while Tottenham are believed to have bid slightly less than that. There is no information regarding any bid from Arsenal at this point, although that’s not to say one hasn’t been made. “Ben came back from International Duty with England last week and we have had developments that suggest a deal will be agreed shortly for him to move when the window opens,” Wallace added.